Sometimes, you start working on a project, and it just gets away from you. When that happens, it goes on the Shelf of Shame and Glory, or you otherwise get it out of your sight. Hey, Bud, this is a good slicer you can cook with but it’s got aesthetic problems so it’s not good enough for someone else but I think it’s probably just in the target-zone for how I feel about you. See what I mean? That’s how the Shelf of Shame gets its denizens. One time, I had a knife that was close but I somehow ground it so that the blade was twisted after I had quenched it. So picture this: you have 12″ of what’s basically a spring – now: straighten it. You can’t! It’s a spring! Banished to The Shelf. The rear of the edge is significantly higher than the front. The whole thing is skewed. Other than that, it would have made a super cool knife! In fact, I was thrilled by it – it’s a composite blade – the cutting edge side is 1095 and the opposite bevel side is cable damascus. Then, I ground a great big fuller right through the 1095 side and into the cable damascus. It was light, thin, flexible, and it was going to make a heck of a slicer, except for the one little thing: it wouldn’t slice straight and a non-expert wouldn’t be able to sharpen it. I put some fruitless effort into correcting it by grinding but it was just too far out of whack. Anyhow, the use of a surface plate is you can take a knife you’re grinding, put it on the plate, and see where it’s high or low. If it’s perfectly flat, the vacuum between the stone and the metal will make it feel sticky. They are cool and beautiful and smooth and they are also perfect for photographing knives on. On the other hand, it’s a perfectly good knife. I’m going to put a handle on it and see how it turns out and then I will think about a home for it. I know people who won’t care that it’s an aesthetic disaster because it cuts fine. The other two problem children have similar issues.. The small one at the top has the cutting edge so offset that it hangs in the middle of the blade and doesn’t even reach the edge. Ironically, 1095 makes a slightly better edge than 15N20, so it’s probably a better knife in that sense but it’s not what I wanted. So I’ll put a handle on it (walnut with some purpleheart caps) and someone will maybe use it to sharpen pencils or something. The one in the middle is cable damascus/15N20/cable damascus and it’s actually pretty good, but the edge is slightly off. I know someone who’ll enjoy having that, I think, but I’m mad that I got that edge slightly off. The throat-piece on the knife is a block of ebony, which I cut to fit the steel through. That’s a lot of work with a jeweler’s saw and little files. I was 3/4 of the way through when I thought, “this is a precision task! The kind of thing a milling machine was made for!” I’ve got a couple 3mm carbide cutters coming, and when they get here I’ll be able to cut the time required for that inletting process down to 1/10 of what it was – and best of all, it’ll be way more accurate. Speaking of accuracy: I now have to make sure not only that the inlet for the tang is accurate, I have to make sure the tang is straight and slightly tapered. One nice thing about this process is that I control everything. One awful thing about this process is that I have to get everything right. Also pictured is one of my favorite tools: stainless steel dentist’s spatula. They are the best thing for mixing and spreading epoxy. That’s not surprising because that’s what dentists designed them for. 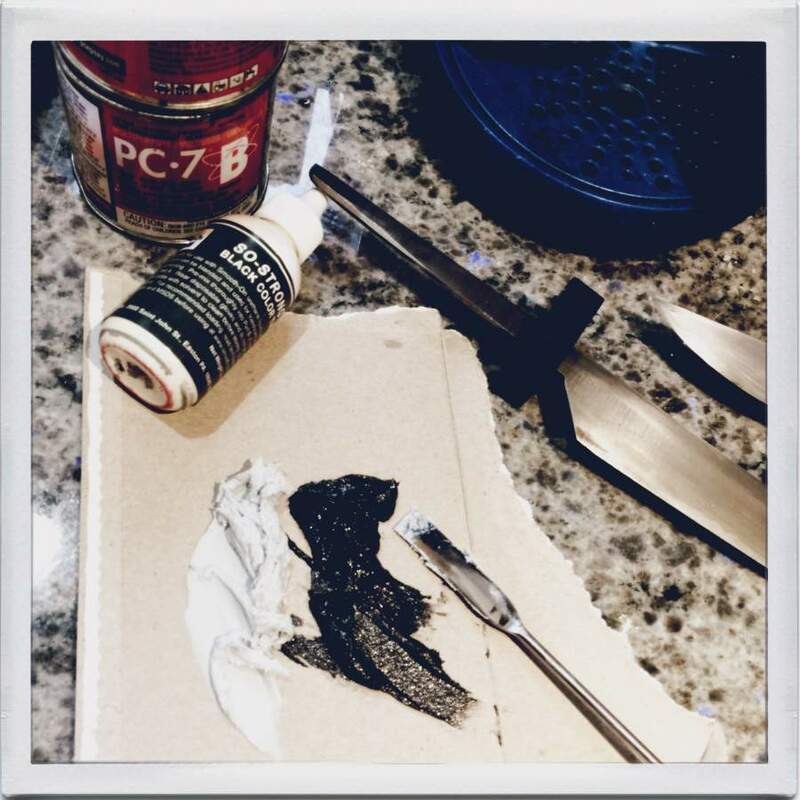 PC7 epoxy, which is what I use to mount my handles, is a sort of industrial gray. Since the throat-piece is ebony, I added a drop of resin pigment to the epoxy and suddenly it was ebony black. 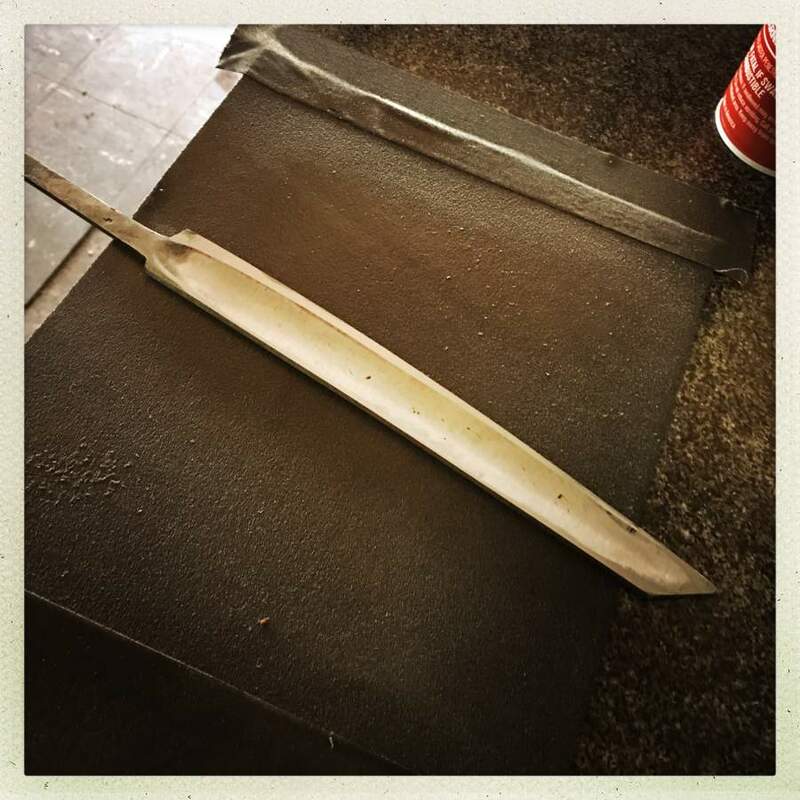 Epoxies, urethanes, and acrylics are a subject of endless debate among knife-makers. My opinion is this: test. Test for strength and ease of use, then test for age. I have made knifes with PC7 since the late 1970s and I know it ages well. 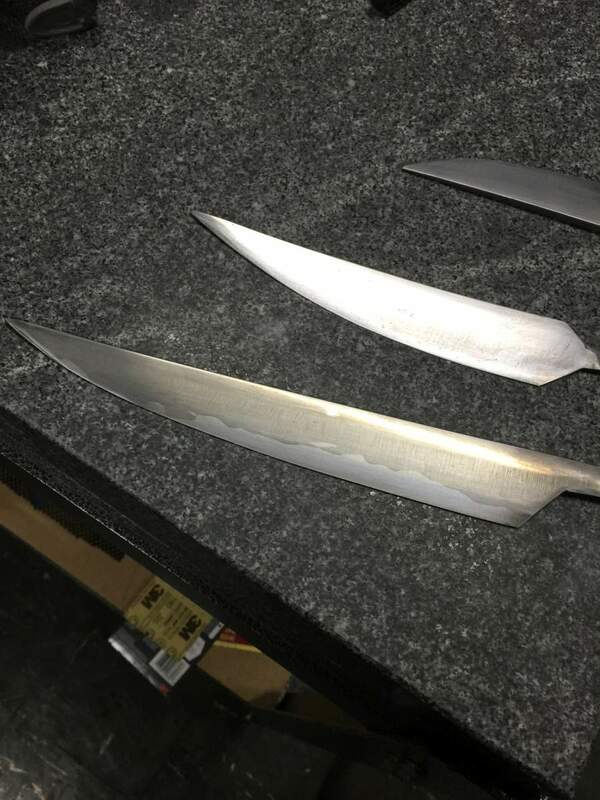 When I read knifemaker forums and someone is talking about “gorilla glue” (foaming urethane) I cringe, because that stuff is hydrophilic and decomposes in water – just about exactly the wrong stuff for a cooking knife. Again, on the theme of “ugly” – I’d rather have a knife with ugly glue than a knife that falls apart. I’ve designed my assembly process/system so that doesn’t happen and if your work has glue-lines it’s because you’re using too much glue and your surfaces don’t mate precisely. Did I mention surface plates? That’s how you get a surface to mate precisely. Besides, it gives me an excuse to have more surface plates than I really need. Do you know a curler that you want to troll? Put a handle on a surface plate. I have a buddy who builds model armored vehicles and I sent him a surface plate for christmas. Some of the plates you can get on Ebay for $45 will fit into a flat-rate shipping box which is all kinds of fun when you have USPS deliver a 35-lb chunk of granite cross-country for $13. If I had an depleted uranium I’d probably mail that in a flat-rate box, too, except it’s a hazardous material that would herald the arrival of inquisitive FBI agents. I am thinking of doing an auction for a knife, all proceeds to go toward the FTB Legal Defense Fund. I don’t feel like I can sell these problem children because they’re not quite good enough, but that might be a way to find them a home. Or maybe I’ll wait until there’s something more worthwhile. There’s also the problem of how to execute an auction: do I just say “email me your gofund me receipts and the highest gets the knife” or do I do it on Ebay and collect the money via Paypal and then donate it? I feel like in honor of my complaining about capitalism, I should try to not create a market for the darned things. When it comes to artworks or other handmade items like knives, you rarely get something that is either absolutely perfect or a total crap. Usually the finished item will be something in between with either minor flaws or flaws so bad that the item becomes unusable. It’s never black or white, perfect or awful; instead it’s a continuum with various degrees of imperfections. Thus it is always up to the artist to decide whether the flaws in their latest work are “acceptable enough,” or whether it’s so bad that the artwork must be scrapped. 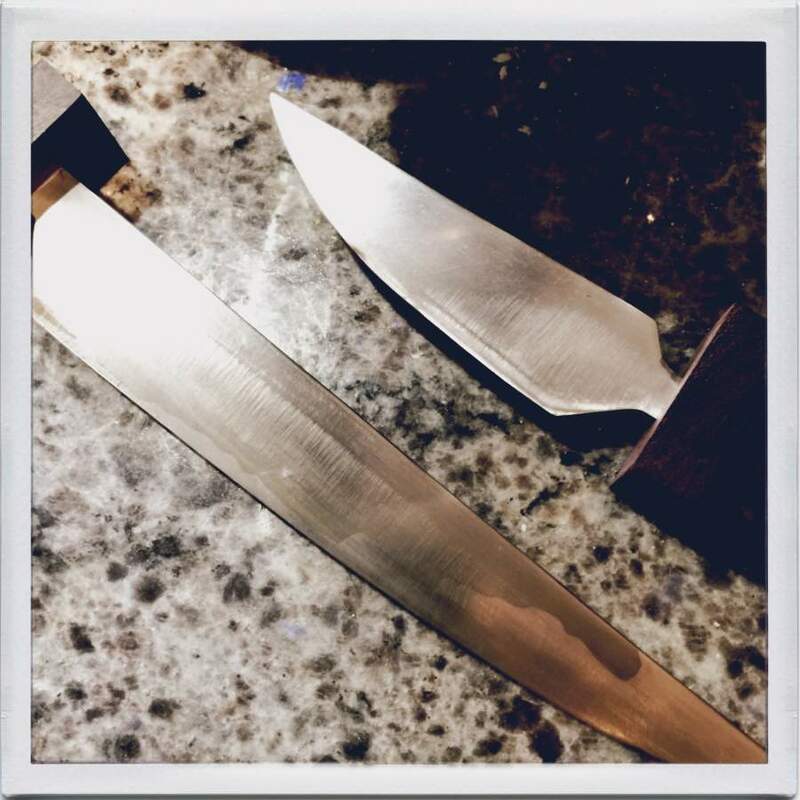 Usually, for most artists, knowing that they can make something better is what sways the decision towards “throw it out.” A very skilled knife maker might choose to scrap a blade which is so good that a beginner would only dream about making something like that. Here’s an example of my own. While painting your Soviet hacker poster, I accidentally made a mistake while applying masking fluid. While painting, artists apply masking fluid to some parts of the paper so that they can paint over it, afterwards they peel off the dry masking fluid, and have white paper underneath. I messed up this process, which resulted in masking fluid adhering to the paper incorrectly. I had to take sandpaper and sand it off. This obviously damaged the paper. For this painting I used a very thick sheet of cotton rag paper, thus I could completely sand off the upper layer of the paper without creating a hole in it. I did damage the surface grain of the paper. I had to decide whether to scrap this painting and start over or to finish it anyway. I chose the latter. If you know what to look for, you can examine the surface grain of the paper in my painting and notice the damage in some parts of the painting. It’s very subtle. I bet you didn’t notice it up until now that I told you. I won’t deny that I was lazy, and didn’t want to scrap a painting and start all over. But this wasn’t what I was thinking when I decided to send you an imperfect painting. I wasn’t thinking, “The painting is ruined, but it will be good enough for Marcus anyway.” The problem with some painting techniques (like watercolour painting, metalpoint drawing, etc.) is that a single slip of hand can create a mistake that is impossible to fix. Thus creating an absolutely perfect artwork is near impossible, even if I scrapped the painting, took a new sheet of paper, and started all over, it would always have some other mistakes (hopefully minor ones that I can live with). That’s what you get with handmade items. They are never perfect. If you want perfection, use a machine to make it instead. And personally I’m OK with my artworks not being perfect. I do try to minimize the flaws and avoid mistakes, but they happen anyway. At the end I just have to decide whether some flaw is so bad that an artwork needs to be scrapped or whether it’s something I can accept. By the way, often what I perceive as a flaw in my artwork is so minor that other people cannot even notice it. I intentionally used the example of the last painting I sent you, because I’m pretty certain you didn’t notice the minor damage of paper underneath all the layers of paint. My point is that, in my opinion, it’s OK for you to give other people imperfect knives. These blades in your photos look nice. Sure, it’s possible to make a better knife, but “acceptable” doesn’t necessarily have to be perceived as a bad thing. Or to put what Ieva said into a pithy saying “Don’t let the perfect be the enemy of the good enough” a lesson that anyone making things needs to learn, and relearn. I like the idea of selling them for the legal fund, you could just make a thread for each of them, name a startng price, a finishng date, and have people post bids, the higest bid at the finish gets it if they pay, if they don’t you go to the next person. You might also consider offering the chance to buy a knife that someone knows they want, like the bread slasher; for example I’d bid for you to make me a vegetable knife with a 5.5cm blade as I haven’t been able to find one that short and doing things like taking the eyes out of potatoes is just awkward with a blade that is longer than your thumb, I can’t be the only person who has an idea of a blade they want, but who hasn’t been able to find what they want on the market. To be more efficient and effective is always good but perfectionism tends to drive people away. The general rule is that we like things and people for how they are nearly perfect, but we love them for their imperfections. A cheap, and usually flat enough, substitution for a surface plate is thick commercial glass. I used to get scraps of 1/2″ glass for a buck or two from a local glass shop. They would salvage these from large commercial sheets that were damaged. Tape on some wet-n-dry paper and it makes a workable way to sharpen. Long before I could afford, or had space in my apartment for, Japanese water stones it was what I used. I am in agreement with the other commenters; I do agree that one should strive to do the best they can do but striving for perfection is perhaps not all that useful. How important is it that vegetable be chopped in perfect straightness? I highly doubt it would influence the taste of the stew or the salad. I worked as a graphic artist for many years and discovered (to my astonishment) that most people can not tell the difference if something is as much as a pica (1/6 of an inch) off. I mean, I sure can. But an awful lot of people can not do it, and TBH, I specially trained myself to see it. And one of my quilting friends told me her frame of reference: if a cowboy riding his horse past your porch can’t see the mistake, well, it probably does not matter much. Now yeah, I get that the usefulness of a knife could be impacted if the blade is badly skewed. However I am not registering badly-skewed in your “problem children”. Ieva said that only she could notice an issue in her work and from my own experience, this is most likely literally true. In fact I’ve worked on something myself, thought, wow, this bit is messed up, but when I am not using magnification I can’t find the “mistake”. Or as I like to think of it now, “design element”. 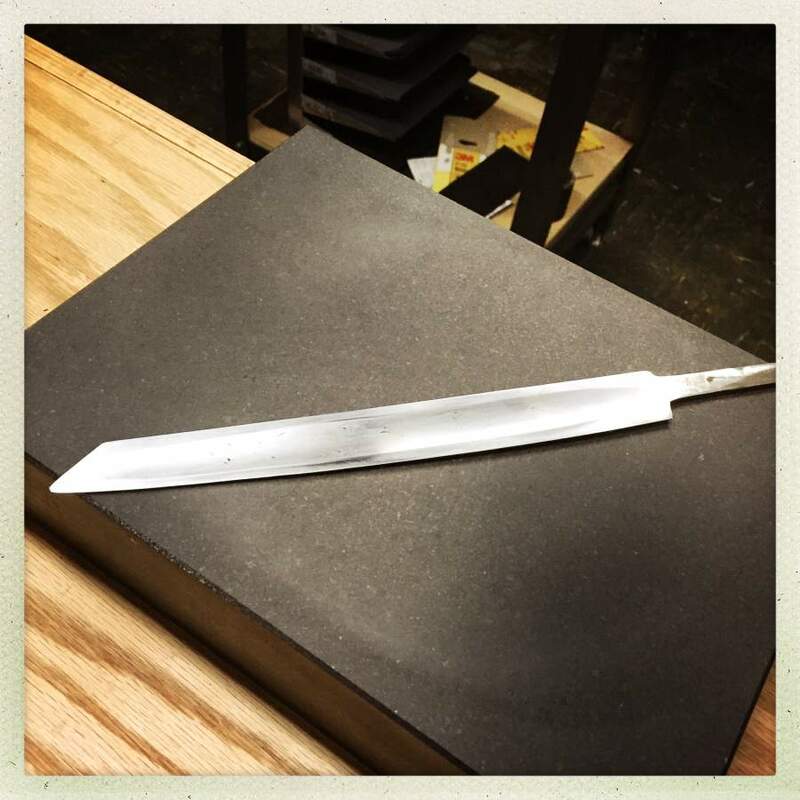 I really should check the one i’m working on: i think the only flaw so far is the vertical warp from heat treating which makes the blade a little more curved than i was intending. The fit of the guard isn’t very precise, but i only have hand tools and minimal skill so it’s pretty good. I could have re-quenched it but it’s already too thin to survive a quench. That blade was a nightmare anyway since it’s got a weird geometry AND it’s bimetal. The takeaway is to edge-quench radical grinds and do the fullers and such after the edge is hard. I read somewhere that the Japanese have a concept of “too perfect”. They’ll sometimes introduce a single intentional flaw into a work to provide a bit of interest. That strikes me as a very sublime way of doing things. I would like to offer you something for that knife that cuts fine but looks a bit funky. I think I’d enjoy that. I don’t know, though, what’s appropriate or if it’s within my means. I don’t know if the Japanese thing is true, btw. Just something interesting I think I might remember reading somewhere. I thought the ancient Greeks had a similar view – human attempts at perfection are hubris. The Japanese term is “wabi” – I believe “wa” is harmony and “wabi” is harmoniousness. What harmony? Between excellence and perfection. I’ve also started seeing a lot of granite slabs recently as they’re used a lot in coordinate measurement machines, which are probably the next stop for many CNC-made parts. They reasoning is much the same: They offer stable, even and smooth surfaces and the chunky pieces are practically immune to temperature fluctuations, so there’s little or no thermal expansion. That’s very helpful when trying to do precision measurements. The slabs are commonly used as a base plate for mounting the rest of the instrument or as a sample table. A common design for CMMs looks like a yoke or gate: Two broad pillars with a beam across. Either the measurement object is placed on a mobile sample table or the beam is moved back and forth along the pillars. The beam in turn supports a column that moves along it as well as up and down. The classical CMM uses a stylus (read: thin metal rod with a ruby sphere at the tip) and repeatedly touches it against the sample object while recording the position of the stylus when it makes contact. CMMs come in all sizes but the biggest one I’ve seen is actually big enough for a person to walk under. Its (intended) use is for wind turbine gears, which can be over a meter across. Because of the sheer size of the machine even the crossbeam is a chunk of granite several meters long. So every time the CMM runs a measurement it has to push a giant rock around to do it. Incidentally, metrologists have the same general problem as you do: However precise the measurement may be there’s always the question if you could do better. As far as I can tell, the correct answer is “Yes, but will it actually be better?”. And the answer to that is usually “no” unless you’ve really made a hash of things. P.S. : If there’s ever a stabby serial killer in your neighbourhood that shelf of shame might raise awkward questions. Add to that an abandoned school filled with all manner of heavy tools and you’ll be the top suspect. Maybe you should start mailing depleted uranium just to establish yourself as a (mostly) harmless eccentric who’s content tormenting mail carriers. The slabs are commonly used as a base plate for mounting the rest of the instrument or as a sample table. A common design for CMMs looks like a yoke or gate: Two broad pillars with a beam across. Either the measurement object is placed on a mobile sample table or the beam is moved back and forth along the pillars. Yes, that’s fairly typical – another great thing about granite blocks is you can drill a hole in one and mount a gauge to it without any risk of distorting it. If there’s ever a stabby serial killer in your neighbourhood that shelf of shame might raise awkward questions. My building was broken into about 10 years ago, and as a consequence I wound up inviting some state police in the door (they are like vampires…) and doing a bit of a guided tour. I made sure the local barracks has all my contact information and I have contact numbers on the doors, so if someone thinks that I may be making weapons of mass destruction, they can call me and not go to the effort of smashing in a door. There have been a couple meth labs and grow buildings busted in my area and my energy-use profile is unusual. I have no desire to have to try to talk down a SWAT team using just my white privilege; those guys are dangerous and stupid. Joking aside, DNA testing makes it a lot easier. They can subpoena my shelf or make me an offer for its contents. I’m thinking this over. I’ll definitely do something to offer a few blades to the Commentariat(tm) as want them but they have to be good enough not to be embarrassing to anyone, and reasonably priced. I think damascus blades are getting ridiculously overpriced at the high end, and that’s because of folks who do these crazy difficult art-welds to make them more exclusive (harder to produce) so these ought not be very expensive, though each of them represents days of my life spent. Easier, yes – not infallible. Trust me, I know.